In a large skillet, brown the ground beef and drain. Stir browned meat into the sauce and heat together. Place 3 lasagna noodles laid out in the pan, spread half of the cottage cheese mixture over this first layer and top with half the tomato sauce/meat mixture. Repeat with another layer of noodles, cottage cheese mixture and sauce, reserving a few large spoonfuls of sauce to drizzle on the top and final layer of noodles. 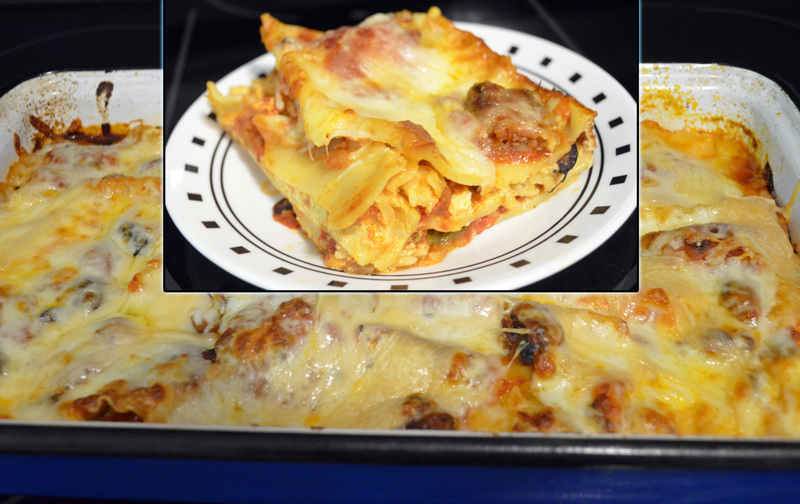 Note: a lasagna pan works best, but you can make this with a 9×13 cake pan. OR Sylvia’s way: Bake without cheese topping at 350 degrees F. for 30-35 minutes until bubbling around the edges. Then add provolone slices over the top, sprinkle with Parmesan cheese, return to oven, and bake another 15 minutes or until cheese is melted and turning golden in spots. 2. Cook macaroni until on the firmer side of al dente, about 7 minutes. I like to under do it because it will continue to soften in the casserole. Drain pasta, then return it to the pot and set aside. 3. In the meantime, heat olive oil in a large skillet over medium heat. Add the onion, green pepper, and mushrooms to the skillet and saute’ until softened, about five minutes. Add the ground beef and cook until no pink remains. Drain the fat, then season to taste. 4. Add the tomato sauce, garlic, oregano, and sugar to the beef mixture. Simmer for five minutes, stirring occasionally. 5. 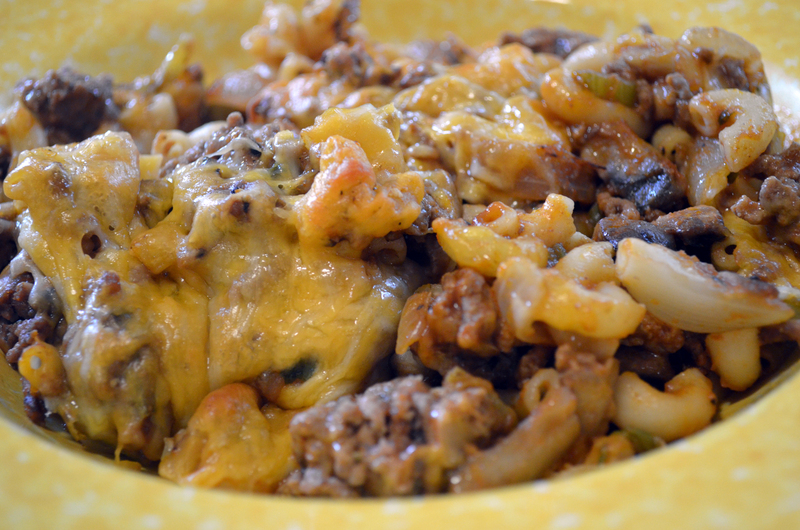 Transfer beef mixture to the pot with the macaroni and stir. Add 1/2 cup of cheddar cheese and 1/2 cup of Italian blend to the mix. Pour the mixture into a 9 x 13 pan. Top with the remaining cheese. Bake for 30 minutes, or until cheese is golden and melted. 6. 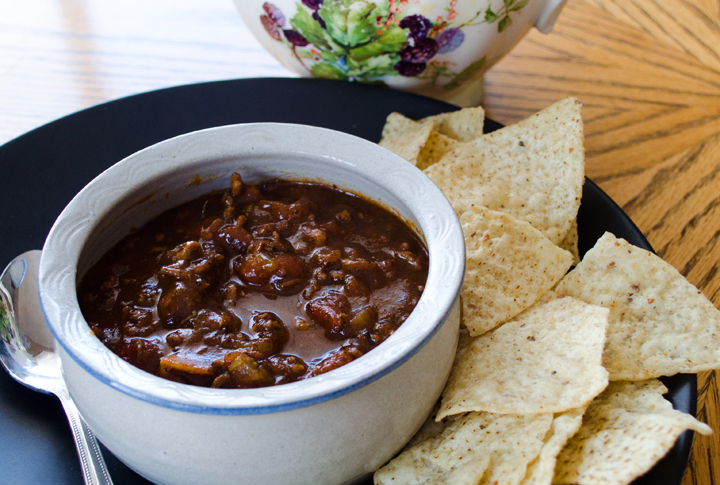 Note: This recipe originated in Columbus, Ohio at the Marzetti restaurant in the 1920s and became famous throughout the Midwest. Dozens of versions have evolved. The only difference between this and the original is the addition of oregano and the Italian blend cheese. Sometimes I swap 1/2 lb. of the ground beef for Italian sausage. ½ lb. mild Italian sausage, browned. Prepare filling and set aside while you boil the shells. Preheat oven to 350 degrees F.
Stuff each cooked shell with about 1 T. ricotta filling, placing them in a greased a 9×13-inch baking dish or a lasagna pan as you go. Use all the filling. 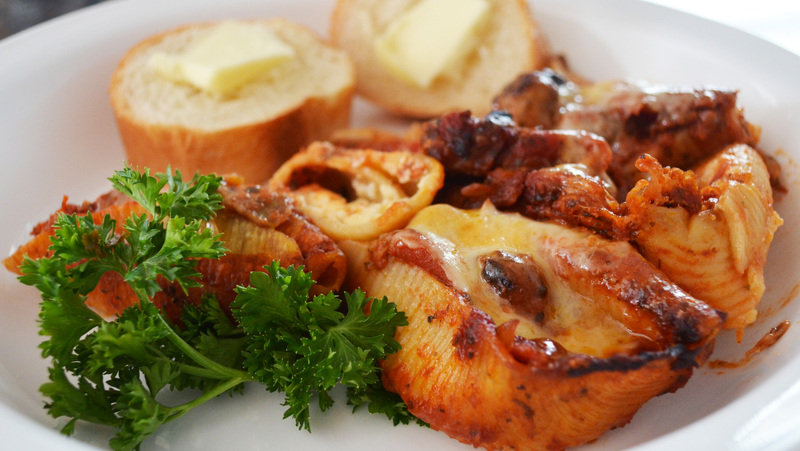 Sprinkle Italian sausage and mushrooms over filled shells. Pour sauce over shells and bake 45-60 minutes until bubbly. Top with additional Parmesan or shredded mozzarella if desired and place under broiler for a minute or so or until golden brown and bubbling. This is ideal if you have only 4 or 5 people for Thanksgiving or Christmas dinner and aren’t up for all the rigmarole that goes with roasting a whole turkey, especially the cleanup. Roast and serve this in one dish. Lightly brown chicken and set aside (don’t cook through). Saute’ the onion (and celery if you’re using it). Tear loaf of bread into pieces. Add a sprinkling of salt and pepper, sage, onion, chicken broth, and 1 can of cream of chicken soup (reserve 2nd can). 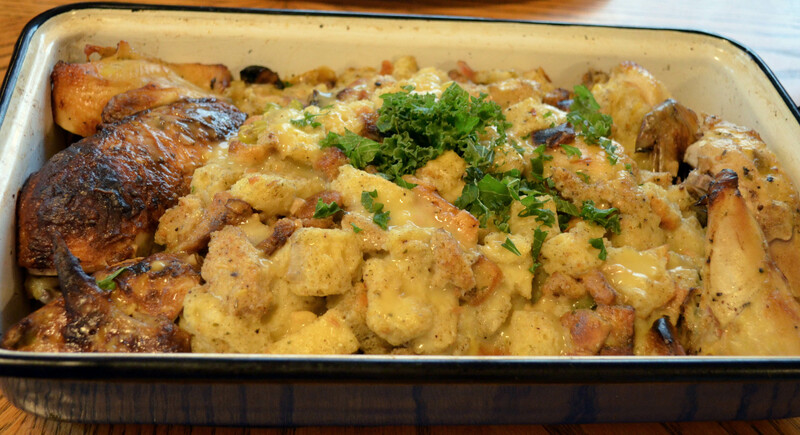 Mix to form a dressing and mound in the center of a large baking dish, leaving room around the edges to surround it with chicken pieces. Place chicken pieces in the dish. Mix reserved can of cream of chicken soup with 1 c. water and pour over chicken and dressing. Bake at 350 degrees for 1 hour or more. Here’s a thought: Why not arrange this in a slow-cooker and cook it that way? I will update this post once I do that. If you try it, let me know how it turns out. 2. Simmer, then add cumin, paprika, chili powder, onion flakes and dried oregano. Add beef broth, stewed tomatoes and green chilis. 3. Add ground beef and simmer 20 minutes. Simmer another 30-40 minutes. 4. Add the chopped cilantro about 10 minutes before serving to keep the flavor fresh. All you need do, is carefully carve the skin from one fresh pineapple, about 1/2 inch thick. Save the flesh for another purpose. You will have 4-6 pieces (try to keep them as large as you can). 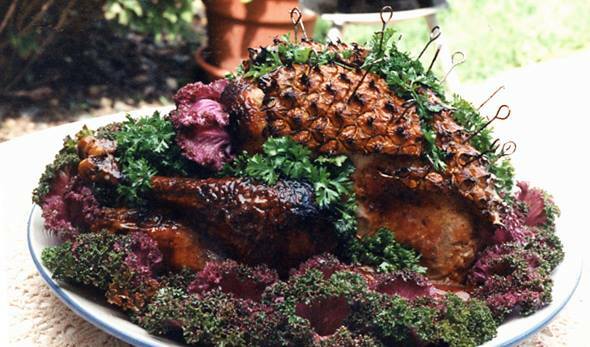 Prepare and truss your bird for roasting as you usually would. Carefully cover the breast area with the pineapple skin pieces, skewering them into place with toothpicks or small metal skewers. You will have cracks between the pieces, that’s okay. The spaces can be filled in later with parsley and kale as you can see in the photo. Roast the turkey according to the instructions. The pineapple will baste the breast and give it a tropical flavor. When done, let the turkey rest 30 minutes, then garnish by surrounding the bird in curly kale (or use your imagination). I found parsley was perfect for tucking into the cracks between the pineapple pieces on the breast. Don’t skip the presentation, the look on the faces of your guests will be worth the extra effort.